The opening of day four of Cub Scout Day Camp was like all the others, a flag ceremony, a thought for the day and announcements. On this day there was a call for rain and potential thunderstorms. We were given instructions to follow in the event there was lightening â€“ but I was not listening because several of the boys were wrestling, some were talking, and one was just having a rough morning and was crying for his mother. So I tried to comfort him, stop the wrestling, and maintain control of twenty eight year old boys. Needless to say, I completely missed the announcements â€“ besides, right then it was hot and there was not a cloud in the sky. Two hours later, a storm blew up within minutes and all the boys were corralled into a large pavilion to wait out the storm. But before we discuss the storm let me go back to the beginning of the day. Before we leave for our first station all the boys are to line up two-by-two and hold up their buddies hand, and in the other hold up their water bottle. They have to go everywhere with their buddy, and they have to drink water constantly (it was hot). So letâ€™s go back to the storm. As we huddled into the pavilion the light rain turned into a thunderstorm. Lightening cracked, and thunder boomed â€“ and it was a solid sheet of heavy rain that blew through the open air building. The rain on top of the tin roof drowned out the Camp Directorâ€™s shouts as she tried to give instructions. The parents who were with our group, and myself made the boys sit down â€“ next to their buddy. Several of the boys began to cry, all were afraid, and one was even praying. So here we were, cold from the rain, huddled together, hearing the cries of our friends, and surrounded by noise that was terrifying (for an eight year old boy). The boys began to put their arms around each other, comforting, and telling each other that it was going to be ok. I held the clipboard with the role, and was going through our group trying to make sure we had everyone and that no one was missing. We had everyone, and now we just had to wait out the storm. I was amazed at how the boys who came from different neighborhoods, schools, and walks of life put aside the childish fun making and joking â€“ and began to truly care for each other. There are always a few in any group that seem to just be mean toward others because of how they dress, look, act, etc. but not then. Every boy was scared and sought comfort from and helped out his buddy. Even when the others cried, they truly sought to help them. H.B. London, head of pastoral ministries for Focus on the Family has disclosed â€œat least 70 percent of pastors in the United States claim they have no friends.â€ That means that most pastors who teach on fellowship and community donâ€™t have these things within their own lives. They see the need in the life of others, but arenâ€™t willing to take those steps in their own lives. Why donâ€™t we have a buddyâ€™s hand that we can hold up? First, many leaders buy into the myth that as the leader they can not show favoritism toward others or it will seem â€œcliquishâ€ and upset others. Some feel they canâ€™t truly be themselves and relax because they still remain to be â€œthe leader.â€ For a pastor this means that they are always the spiritual leader and always feel as though they set the example for others to follow. Whatever the reason (true or false) many people find themselves in a storm alone. The thunder booms and the lightening strikes, and they are sacred to death â€“ and there is no comfort. As a pastor I am supposed to tell you to read your Bible and seek comfort from Christ â€“ but we areÂ also designed by God to need other people in our lives. God created â€œwomanâ€ for â€œmanâ€ in the Garden of Eden. The apostle Paul describes the church as a body â€“ and there is a need for all the parts to work together and to present. There are many more examples of Scripture of where men/mankind need friendships, family, and meaningful relationships. How Do We Find A Buddy? 1) Assign yourself to a person and stick with them all week. 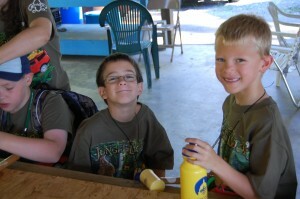 At Cub Scout Camp all the boys chose a buddy and some (for various reasons) were assigned a buddy. Glen was assigned to Jared. Glen took this responsibility very seriously, but Jared would run off from the group, disrupt the â€œquiet timesâ€ during the flag ceremonies with (letâ€™s just say boys sounds), and it was all around very difficult to be his buddy. On the second day I asked Glen if he wanted to make a buddy group of three with another group of two and I would assign our older Scout helper to be Jaredâ€™s buddy. Glen said, â€œnoâ€ he wanted to stay with Jared. And he did all week. Glen put up with a lot of grief â€“ but when the storm on day four hit both were comforted. Jared and Glen needed a buddy. Perhaps, as adults we donâ€™t have one because we bounce from person to person, group to group, when they prove to be difficult to be their buddy. 2) Always stay with your buddy. The reason why Boy Scouts of America pushes the buddy system so strongly is because of the numerous accounts of where a scouts got lost, drowned, hurt, etc.. because they got turned around and there was no one there to keep account of them. We all need someone there to make sure we are on the right path, going in the right direction, and following the safety rules. Buddies keep us safe, itâ€™s as simple as that. The only way for the buddy system to work is that we have to always stay with our buddy. 3) Be a good friend. But if you watch them play together they are good friends. They share, pat each other on the back, cheer when they do well, say â€œthatâ€™s okâ€ when they donâ€™t do so well. They open up their hearts and share moments in time together as friends. Adults seem so guarded, and focused on what they get out of the relationship â€“ but kids are there to make a friend and have a great time. The storm passed and we went on our way. It quickly was forgotten about as we went to Scout Skills and swimming. Parents showed up at the end to pick up their kids, and it wasnâ€™t the storm that they talked about with them, it was the activities that followed.